This volume seeks to identify and examine two categories of colonial and postcolonial knowledge production about Africa. These two broad categories are "environment" and "landscape," and both are useful and problematic to explore. Discussions about African environments often concentrate on Africans as perpetrators of their own land, causing degradation from lack of knowledge and technology. "Landscape" defines the category of knowledge produced by foreigners about Africa, where Africans remain part of the scenery and yield no agency over their surroundings. 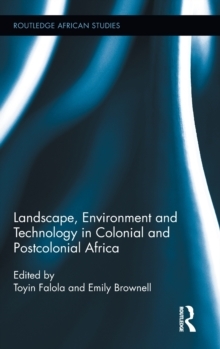 To flesh out these categories and explore their creation and how they have been deployed to shape colonial and postcolonial discourses on Africa, this volume investigates the "technological pastoral," the points of convergence and conflict between Western notions of pastoral Africa and the introduction of colonial technology, scientific ideas and commodification of land and animals.